Home » UNE DOSE DE FRANCAIS.. So this post has been long overdue but since blogger was down for a while I had no choice but to wait to upload these from the day Eoin and I went out and took some French themed photos! It was definitely something we worked hard for too – the weather was freezing, it was wet, we walked all around the city and by the end of it our fingers were so numb feeling was lost for at least an hour. Anyway, here’s the final few from the day out! Leading with the winning photo of course! This one was taken on Henry St. Eoin had the idea of replacing (or at least trying to replace) the Spire with the miniature Eiffel Tower we had. This pretty much led to us standing on Henry St, crowds of people walking by, holding up the key ring trying to get a decent photo. We eventually gave up but through the power of technology, we realised that the photo didn’t actually look half bad in black and white. Win all round really! This is me setting up the next photo in a puddle beside the fountain in St Stephen’s Green. 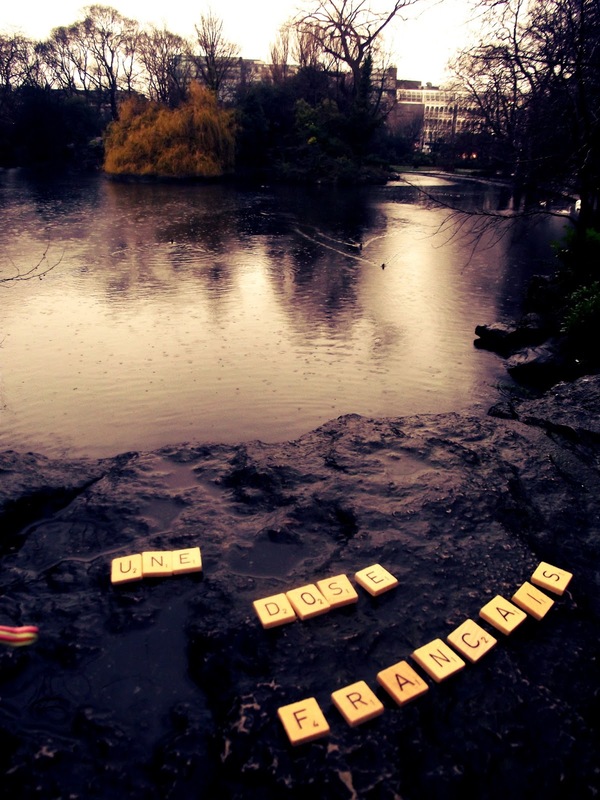 I was using scrabble pieces to ask the very pressing question – Ou est le soleil? Or in English – where is the sun? This next one was taken near the Ha’penny bridge. We couldn’t get a good photo of the flag and bridge together until Eoin realised that we could use Panorama on the camera and save ourselves all the hassle. Just as we tried to do this, you’ll notice the flag, very typically, gets itself wrapped around the pole and so the photo wasn’t what we wanted it to be. This final one was taken at my house with Conor’s scrabble board. You’ll notice the board itself is in Irish – beggars can’t be choosers I’m afraid. It worked out nicely enough but sadly we didn’t have half enough “E”s in the set. Something worth complaining about?